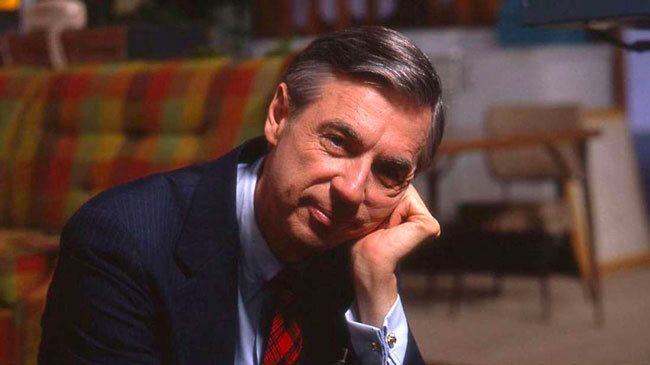 What Mister Rogers Didn’t Know About His Neighborhood … But You Should! In the classic children’s TV series, Mister Roger’s Neighborhood, viewers are swept away to a Land of Make Believe – a utopian neighborhood created by their red cardigan-wearing host, Mr. Rogers. Before you take off your sneakers, slip into your slippers, and fully commit to his infamous question, “Won’t you be my neighbor?” there are some things you need to know about the impact your neighborhood has on your brain. Where you live, who you live with, what you eat, your daily habits … they all matter. How much? Well, you’re about to find out… and it’s a bit scary! “You are unique” is not just an encouraging phrase your parents told you to help you feel better about that one thing that stood out compared to your peers. It is actually true. There is no one in the world with a brain exactly like yours. What makes you unique, and how to influence these factors with your students is our topic for this month. It was a long-held belief that your genes held the secret code for your abilities, behaviors, health, and cognitive capacity. Then it was discovered that environmental factors influence all of these as well. After years of battling it out in research labs around the world, the two sides came to a truce of understanding – both genes and environment are at play. That still holds true. Yes, both genes and environment contribute to an individual’s brain fingerprint. Here is the most fascinating breakthrough in this realm: our environment can actually influence our genes (Gottesman & Hanson, 2005). Initial research first suggested that environmental factors had the capacity to suppress genes or allow them to express their message. In other words, the environmental trigger was a gatekeeper that either closed or opened the door for gene expression. The researchers have NOW discovered that some environmental messages are embedded in your body at a cellular level and are carried generationally in the genes. For example, mother rats exposed to chemicals during pregnancy gave birth to four successive generations of male offspring with significantly reduced fertility. Yet only the first generation of mothers was exposed to a toxin (Crews et. al., 2007). What about humans, you ask? Your neighborhood (and every neighborhood you’ve ever lived in) has left a lasting impression on your body. I’m not talking about all your fond memories of bike rides as a kid or sneaking out as a teen. The impact is so strong that from a single strand of hair, scientists can now determine each of the places you have ever lived (Ehleringer, et al., 2008). To understand HOW this is possible, here’s a brief overview of the major factors from those neighborhoods that have altered your brain and body. More importantly, you’ll get the research that shows how much you are different because of which neighborhoods you have lived in. Traditionally, men have a higher employment rate than women. This gender gap in employment rates is reversed for children who grew up in poverty. For children raised in high-poverty, high-minority neighborhoods, it is the women who have a significantly higher employment rate than men (Chetty, Hendren, Lin, Majerovitz, & Scuderi, 2016). The largest income disparity exists between black and white Americans. This growing gap even exists for kids who grew up in the exact same neighborhood. Black boys, from the same neighborhood as white boys, have lower incomes in adulthood (Chetty, Hendren, Jones, & Porter, 2018). Racial bias for men is as real in classrooms as it is on their adult paycheck. In better news, there is no significant income difference for black and white women. The people you surround yourself with in childhood leave a lasting impression into adulthood. Being exposed to inventors as a child significantly increases your chances of being an inventor (Bell, Chetty, Jaravel, Petkova, & Van Reenen, 2017). We could probably say the same about most career paths – were you surrounded by several educators in your youth? Your parents, their friends, other relatives, neighbors, etc. are all players in defining your environment. Money might not be able to buy you happiness, but it is still providing more opportunities for people. If your parents happen to be in the top 1% of income earnings you are 77x more likely to attend an Ivy League school compared to those in the bottom 20% of income (Bell, Chetty, Jaravel, Petkova, & Van Reenen, 2017). The main message is this: gender, race, income, familial and social connections ALL impact a young person and their future opportunities. Neighborhoods influence optimism, social contacts, and resources. But there is SO MUCH we can do to help even the playing field. We’ll get to that soon. The larger the city you live in, the greater the chance you are exposed to CO2 emissions. Urban areas tend to have higher carbon dioxide emissions compared to suburban areas. Why might this be a concern for you? CO2 shows a dramatic increase when a more rural area is converted into suburban developments (Mitchell et al., 2018). Here is why CO2 emissions are so dangerous: it can impair cognitive and behavioral development, raise your likelihood of getting a respiratory illness, and multiple chronic diseases (Perera, 2017). The quality of indoor air is an important issue because people inhale up to 15,000 liters of air/day (Wood et al. 2002). Any contaminants produce pollutants present in the air. Poor air quality hurts learning and concentration in schools, plus they are a health hazard for kids and teachers (Daisey, Angell, Apte, 2003). Even the water you drink has a lasting impact on your body, and thus your brain. Researchers have been able to correlate the oxygen isotope levels in students’ hair to the tap water available nearby (Tipple, Valenzuela, & Ehleringer, 2018). Think this is a minor detail? Poor quality water (with traces of toxins, metal, etc.) impact various regions of the brain critical for learning – the hippocampus and inferior and superior temporal cortex (Schreurs, & Sparks, 2016). On the other hand, certain clean waters have been shown to protect against neurodegenerative diseases (i.e. Alzheimer’s) and reverse some of the brain impacts from a traumatic brain injury (Dohi et al., 2014). Air and water are essential elements for your physical, emotional, and cognitive health. 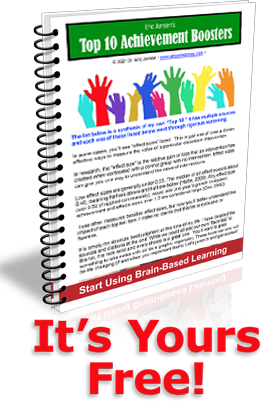 The brain needs both – the better the quality, the better the function. Each of these factors (and more) impact brain chemistry, structures, and function. The way in which our environment regulates our genes is called epigeneticsand it is a blockbuster new understanding about the brain. “Epigenetic signatures influenced by the environment may determine our appearance, behavior, stress response, disease susceptibility, and even longevity” (Tammen, Friso & Choi, 2013). In short, the environmental factors that many of us took for granted, we now know they are involved in gene expression, suppression or even gene mutation. Neighborhoods DO Matter, as you just read. But schools contribute over 900 hours a year of influence on students. That’s enough time to make dramatic differences. Much of the adversity in a student’s life CAN be overcome by the combination of quality classroom teaching (Chetty, Friedman, & Rockoff, 2012) and strong school culture (Benner & Mistry, 2007). Start paying attention to any hidden biases you might have regarding race, gender, or income levels. They might be subtle, but you want to be part of the solution and not reinforcing the problem, right? (Lindsay & Hart, 2017). Reflect on which students are getting more of your time, positive attention, and relationship building. Strengthen your connection with all students.Also, facilitate stronger connections between students through more diverse group activities. Provide examples of diverse role models so ALL students can recognize themselves in successful people who have risen above their original “neighborhood”. Ensure students are being exposed to clean classroom air and safe, drinkable water at school. If you have toxic water, use water or plant filters. Plants in the classroom can help filter the air.What are the best plants at filtering air and even contributing to biodiversity? Spider plants are, hands down, one of the best classroom air filters. Other great toxin-absorbing plants are snake plants, peace lilies, and bamboo palm (Wolverton & Wolverton, 1993). They contribute substantially to the microbial abundance and diversity in the built environment and absorb toxins at a higher rate than any other plant (Mahnert, Moissl-Eichinger, & Berg, 2015). When it comes to changing lifestyle habits, like-minded people can have influence, and knowledge is power! Help students make contacts in school and the community for building and strengthening positive social connections. WHO you know is as or more important than what you know. Bring in guest speakers with ethnicities just like those in class who share HOW they succeeded.Teach students the importance of a healthier diet, exercise, and sleep. Teach mindfulness, and breathing exercises to reduce stress. Introduce other positive lifestyle habits such as practicing gratitude, journaling, goal setting, etc.In your classroom instruction, reduce surprises that might spark anxiety. Create a class-wide competition for exercise as it relates to content you are studying (as a class let’s walk/run/bike the same length as the length of our state, or the Appalachian or Oregon Trail!). Abel, T., Havekes, R., Saletin, J. M., & Walker, M. P. (2013). Sleep, plasticity and memory from molecules to whole-brain networks. Current biology, 23(17), R774-R788. Bell, A. M., Chetty, R., Jaravel, X., Petkova, N., & Van Reenen, J. (2017). Who becomes an inventor in America? The importance of exposure to innovation (No. w24062). National Bureau of Economic Research. Benner, A. D., & Mistry, R. S. (2007). Congruence of mother and teacher educational expectations and low-income youth’s academic competence. Journal of Educational Psychology, 99(1), 140-153. Chetty, R., Hendren, N., Jones, M. R., & Porter, S. R. (2018). Race and economic opportunity in the United States: An intergenerational perspective (No. w24441). National Bureau of Economic Research. Chetty, R., Hendren, N., Lin, F., Majerovitz, J., & Scuderi, B. (2016). Childhood environment and gender gaps in adulthood. American Economic Review, 106(5), 282-88. Daisey JM, Angell WJ, Apte MG, (2003). Indoor air quality, ventilation and health symptoms in schools: an analysis of existing information. Indoor Air. 13, 53-64. Dohi, K., Kraemer, B. C., Erickson, M. A., McMillan, P. J., Kovac, A., Flachbartova, Z., … & Banks, W. A. (2014). Molecular hydrogen in drinking water protects against neurodegenerative changes induced by traumatic brain injury. PLoS One, 9(9), e108034. Ehleringer, J. R., Bowen, G. J., Chesson, L. A., West, A. G., Podlesak, D. W., & Cerling, T. E. (2008). Hydrogen and oxygen isotope ratios in human hair are related to geography. Proceedings of the National Academy of Sciences, 105(8), 2788-2793. Gottesman II, Hanson DR. (2005) Human development: biological and genetic processes. Annual Review of Psychology. 56:263-86. Lindsay, C. A., & Hart, D. M. (2017). Exposure to Same-Race Teachers and Student Disciplinary Outcomes for Black Students in North Carolina. Educational Evaluation and Policy Analysis, 39, 485–510. Mahnert, A., Moissl-Eichinger, C., & Berg, G. (2015). Microbiome interplay: plants alter microbial abundance and diversity within the built environment. Frontiers in microbiology, 6, 887. Michael, S. L., Merlo, C. L., Basch, C. E., Wentzel, K. R., & Wechsler, H. (2015). Critical Connections: Health and Academics. Journal of School Health, 85(11), 740-758. Mitchell, L. E., Lin, J. C., Bowling, D. R., Pataki, D. E., Strong, C., Schauer, A. J., … & Mallia, D. (2018). Long-term urban carbon dioxide observations reveal spatial and temporal dynamics related to urban characteristics and growth. Proceedings of the National Academy of Sciences, 115(12), 2912-2917. Ota, M., Matsuo, J., Ishida, I., Hattori, K., Teraishi, T., Tonouchi, H., … & Kunugi, H. (2016). Effect of a ketogenic meal on cognitive function in elderly adults: potential for cognitive enhancement. Psychopharmacology, 233(21-22), 3797-3802. Perera, F. (2017). Pollution from Fossil-Fuel Combustion is the Leading Environmental Threat to Global Pediatric Health and Equity: Solutions Exist. International journal of environmental research and public health, 15(1), 16. Schreurs, B. G., & Sparks, D. L. (2016). Dietary high cholesterol and trace metals in the drinking water increase levels of ABCA1 in the rabbit hippocampus and temporal cortex. Journal of Alzheimer’s Disease, 49(1), 201-209. Stanley, D. A., & Adolphs, R. (2013). Toward a Neural Basis for Social Behavior. Neuron, 80(3), 816-826. Tammen SA, Friso S, Choi SW. (2013). Epigenetics: the link between nature and nurture. Mol. Aspects Med. 34, 753-64. Tipple, B. J., Valenzuela, L. O., & Ehleringer, J. R. (2018). Strontium isotope ratios of human hair record intra-city variations in tap water source. Scientific reports, 8(1), 3334. Wolverton, B. C., Johnson, A., & Bounds, K. (1989). Interior landscape plants for indoor air pollution abatement. Wolverton, B. C., & Wolverton, J. D. (1993). Plants and soil microorganisms: removal of formaldehyde, xylene, and ammonia from the indoor environment. Journal of the Mississippi Academy of Sciences, 38(2), 11-15.
https://www.jensenlearning.com/wp-content/uploads/2019/01/rogers.jpg 365 650 Eric Jensen https://www.jensenlearning.com/wp-content/uploads/2017/04/jensenlogo-small.jpg Eric Jensen2019-01-28 10:15:242019-03-05 17:47:24What Mister Rogers Didn’t Know About His Neighborhood … But You Should! Do You Carry This Around with You? If So, Please Stop!